The Supreme Court opened its October 2014 Term by hearing oral argument in Heien v. North Carolina, which raises the question: Whether a police officer’s mistake of law can provide the individualized suspicion that the Fourth Amendment requires to justify a traffic stop? I am using the same method of predicting the winner of the case that I have used before, which is based simply on the total number of questions each party receives. Other scholars have shown that the more questions an advocate receives during oral argument before the Supreme Court, the more likely the advocate will lose the case. For more about this method, see my post on last Term’s Aereo case. In this case, we have the confounding factor of the Solicitor General’s participation on the side of the Respondent. The participation of the SG is confounding in two respects: (1) it decreases the time the party whose side it supports has during the oral argument (usually by 10 minutes), thus decreasing the time the party is questioned and increasing the likelihood the party will receive fewer questions than the opposing party, who is questioned for the full 30 minutes; and (2) the Supreme Court often ends up agreeing with the side that the SG supports. I also should mention that I am not an expert in Fourth Amendment law and have not studied the Court’s jurisprudence in this area (at least not since law school). With those caveats in mind, my prediction is that the Supreme Court will side with the State of North Carolina, which received eleven fewer questions than the Petitioner. However, the disparity of questions between both parties is not large, so my confidence level in the prediction is not very great. From my analysis of last year’s IP cases, the predictive value of the question-counting method appeared to work best when the disparity of questions between the parties was great (excluding the SG’s participation). 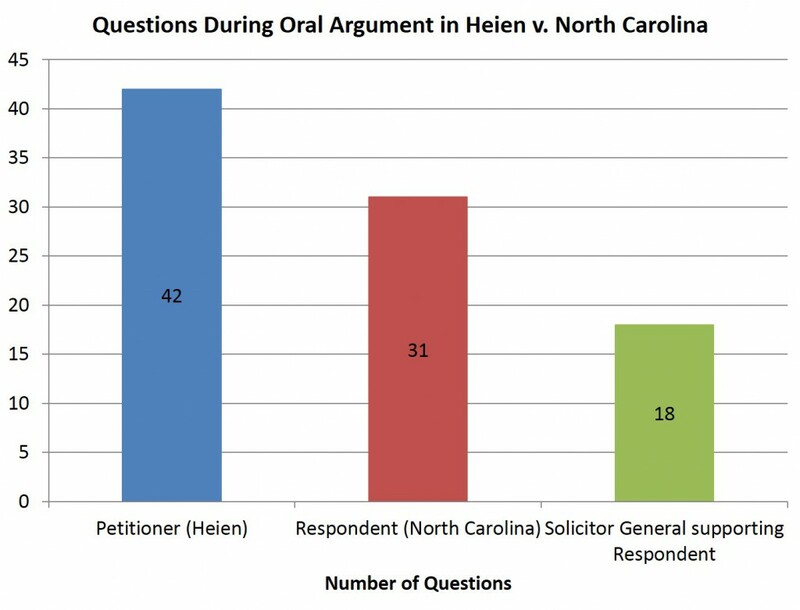 If we calculate the questions asked per minute to each party, the Respondent North Carolina actually had the higher rate of questioning (1.55 questions per minute versus 1.4 questions per minute for the Petitioner). As the Term progresses, I hope to refine the method, especially in cases in which the SG participates. But for now, my prediction in this case will be for North Carolina. Did you do this last Term? If so, how did it turn out? Thanks for the update. Can’t wait to hear the arguments on your website!